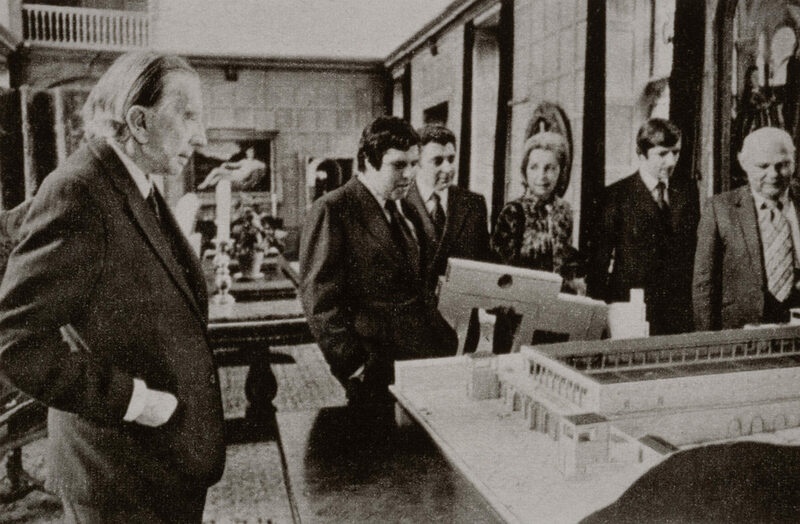 J. Paul Getty (at left) views a model of the Getty Villa at Sutton Place, his home in England, in 1971. The Getty Research Institute, Institutional Archives. Ironically, J. Paul Getty never saw the Getty Villa. He died two years after his museum opened to the public in January 1974 in a new building modeled on an ancient Roman luxury home. It was not until after Getty’s death in June 1976 that he returned from his estate in England to his “ranch” on the Pacific Coast: he is buried there at the edge of the property on a private plot overlooking the ocean, alongside his eldest and youngest sons, George and Timothy, both of whom predeceased him. Following a renovation and reinstallation of the galleries, the Getty Villa opens a new chapter in its history. Although Getty never set eyes on his creation, the story of how he built the Villa and assembled his collection pervades the galleries even today. A suite of revamped rooms—Galleries 105 to 108—share this history. Featuring ancient works of art Getty bought himself along with archival documents, the new displays place the objects in their cultural contexts and shed light on Getty’s personal relationship to his museum and final resting place. 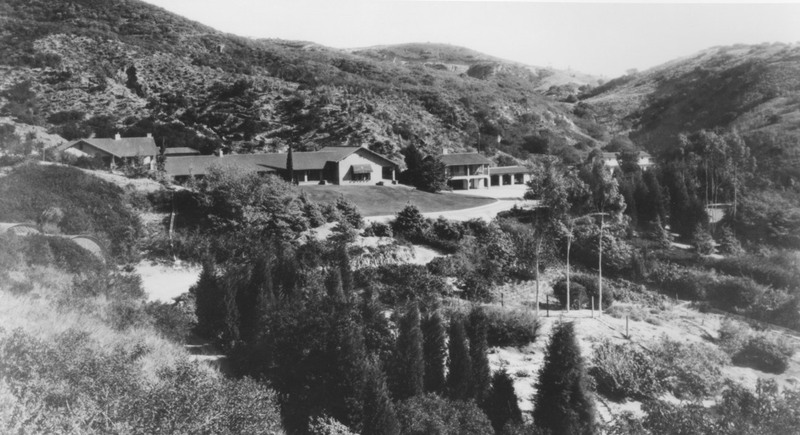 Getty bought the 64-acre ranch—once part of the Rancho Boca de Santa Monica, an early-nineteenth-century 6,656-acre Mexican land grant—just after the end of World War II, intending it as a weekend retreat where his fifth wife Theodora (“Teddy”) could ride horses and he could display his growing art collection. After buying the property, Getty remodeled the low-slung “Ranch House,” adding a second story and several Spanish-style features. Although Getty left the United States permanently in 1951, leaving Teddy and their son Timmy behind, he continued to fill the Ranch House with works of art, and in 1954 it opened it to the public as the J. Paul Getty Museum. Over time he added to the building to accommodate his growing collection, and by the late 1960s it needed to expand further. Getty’s architects drew up several proposals in a variety of styles—Spanish, European, and modern—all of which he rejected. Ultimately, he decided to construct a replica of the ancient Villa dei Papiri at Herculaeneum, which was buried in the eruption of Mt. Vesuvius in AD 79. Several newly reinstalled galleries on the first floor of the Getty Villa feature objects that speak to both their ancient and modern histories. 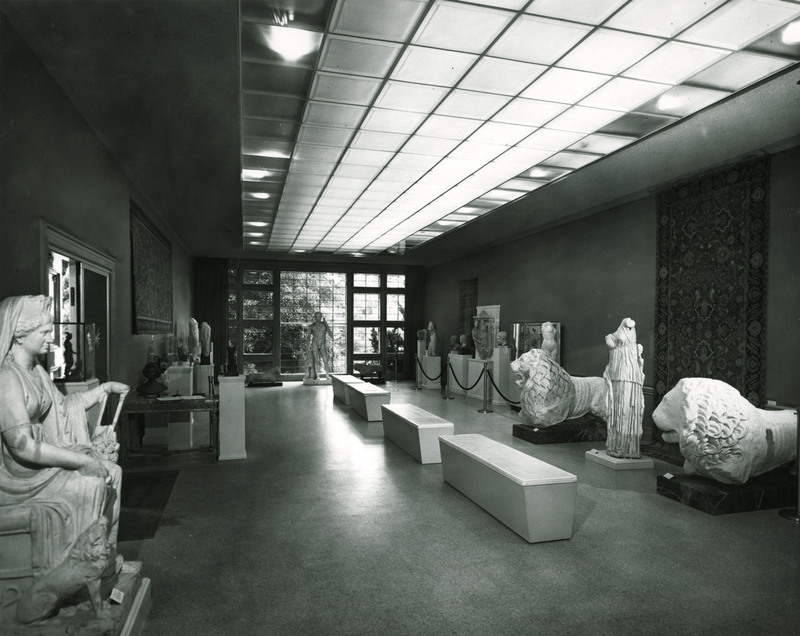 Gallery 105, known as the Hall of Colored Marbles, is dominated by a marble statue of Venus. Getty readily admitted that he “enjoyed the company of women,” and when the Villa first opened in 1974 an entire gallery was devoted to images of the goddess of love. When planning the new display we therefore decided that the first of two built-in vitrines in this gallery would focus on representations of Venus in various media: terracotta, marble, and bronze. The smallest object in the case, a finely worked bronze head of the goddess, once attached to a larger figure, is remarkable for the preservation of a golden earring with a single pearl. Pearls were highly prized in antiquity, as they are today, and fetched vast prices. 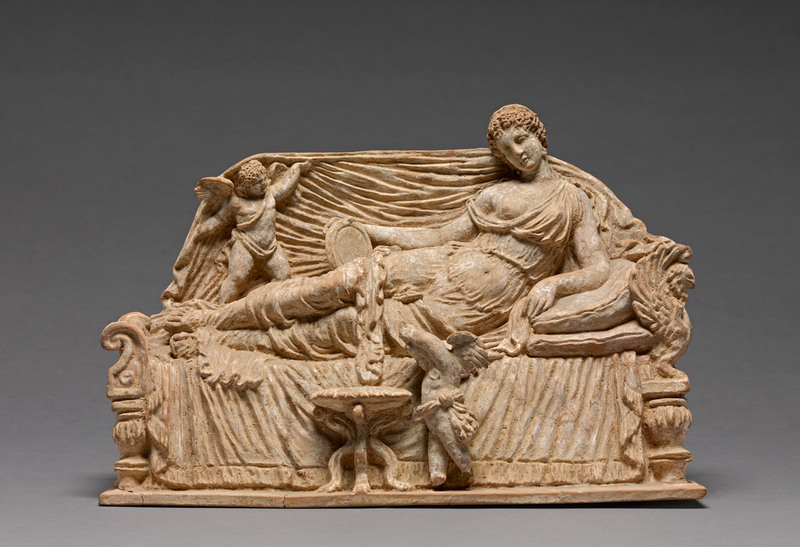 The largest object in the case, a terracotta group of a Woman Reclining on a Couch with Cupids, is still more intriguing. It is the first “antiquity” that Getty purchased. In 1939, when he was in Rome courting Teddy, who was studying to be an opera singer, he placed a number of absentee bids on items being sold from an aristocratic collection in London. He was particularly interested in the tapestries, but on the same page of the auction catalogue as some of the objects he most desired was the listing for this terracotta. It was associated with similar ones found at the Greek site of Tanagra in the late nineteenth century. These artworks were popular among collectors for the vivacity of their compositions and the insights they seemed to provide into daily life in the ancient world. As with all his purchases, Getty was canny, seeking to get the best possible price. 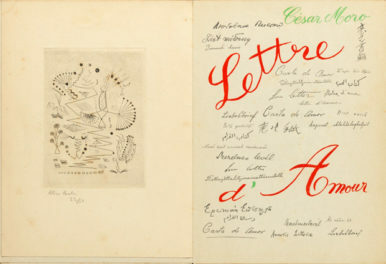 But his annotated auction catalogue, rediscovered in the collections of the Getty Research Institute library by former Getty Museum curatorial assistant Laure Marest-Caffey (now the Cornelius and Emily Vermeule Curator of Greek and Roman Art at the Museum of Fine Arts, Boston) reveals that Getty himself had doubts about its authenticity. In the margin beneath the entry he wrote, “modern?” The terracotta belonged to a venerable English collection, so Getty was willing to take a chance. His low bid of £10 prevailed, but his first antiquity turned out not to be an antiquity at all. This story and others about J. Paul Getty and the growth of his collections are told in an innovative display in Gallery 107. Building on the ongoing installation J. Paul Getty: Life and Legacy at the Getty Center, this interactive program, installed alongside some of Getty’s favorite ancient sculptures, allows visitors to explore hundreds of archival photographs, maps, graphs, and other resources relating to Getty’s family, business, travels, development of his collections, decision to build the Villa, and lasting legacy. The Lansdowne Hercules, about A.D. 125, Roman. Marble, 76 3/16 × 30 1/2 × 28 3/4 in. 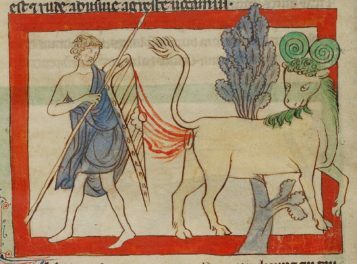 The J. Paul Getty Museum, 70.AA.109. Pictured in the Temple of Hercules (Gallery 108). 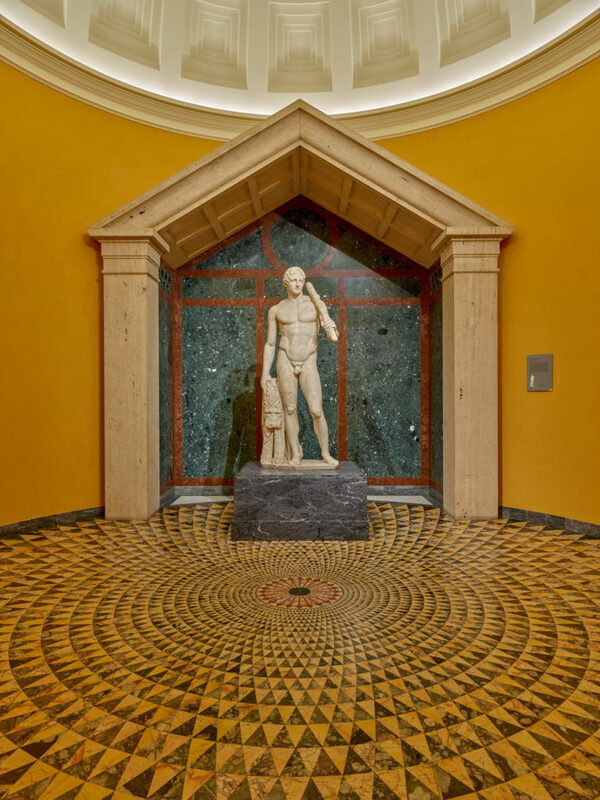 Gallery 108, known as the Temple of Hercules, meanwhile appears much as it did before the reinstallation, but it now features improved lighting and a smaller seismic isolator underneath the famous statue of the Lansdowne Hercules. This change enables more of the splendid polychrome marble floor to show; it’s a replica of one of the first finds by well-diggers who discovered the Villa dei Papiri in 1750. The ancient villa is itself the focus of a newly installed cubiculum just off the Atrium, Gallery 101C, and it will be the subject of an international loan exhibition in the summer of 2019. While Getty never visited his Villa, his legacy continues to endure. From his architectural choices to the objects he collected, his twentieth-century history blends with that of ancient times, yielding stories that captivate us even today. How well I remember visiting the old Getty Museum in the 1960s. It was only open one day a month and one had to make an appointment in order to go. I made many appointments. I remember the installation of the paneled room filled with Gettys acquisitions of FFF- fine French furniture. A place I would have loved to be locked in and spend the night! My late husband and I visited Getty Villa several years ago. After reading your newsletter I am planning another visit. Thank you for the information about the “updated Villa”. Will see you sometime this year.